This challenge was both exciting and, to be honest, a little nerve-racking. I've spent my entire musical life writing and arranging for bands of various sizes; I know how the instruments work--their interplay, their limitations, and their strengths--but the same can't be said of my knowledge of how a symphony orchestra works. While I've always loved symphonic music, I don't have the adequate expertise to know how banks of string players are organized, or brass or woodwinds for that matter. Nor did I have time for a crash course in orchestration, which I imagine would be equivalent to an attempt at flying an airliner after a cursory test drive of a flight simulator. No, I was under no illusions about my abilities here. I needed help and I needed it fast. I put in a call to my dear friend and long-time collaborator Dave Hartley. Dave is London's premiere session piano player. He and I met working on Mike Figgis' film Leaving Las Vegas and eventually tackled another film score together, "The Emperor's New Groove" or Disney. Most important, Dave had provided the orchestrations for my album tracks "Tomorrow We'll See" and "Big Lie Small World," as well as the string quartet arrangement of "Until" for the movie Kate and Leopold. This went on to win a Golden Globe Award and garnered an Oscar nomination, as did "You Will Be My Ain True Love" for Cold Mountain and "My Funny Friend and Me" for Disney. Dave was indispensable on all of these projects and kindly agreed to arrange some of the songs and oversee the process of selecting and dealing with the other arrangers that we would need to complete the assignment. My brief to them through Dave was simple; have fun, don't slavishly follow the existing structure of the songs and most important, challenge the orchestra rhythmically; I didn't want them to be merely providing an interesting backdrop while sawing whole notes behind a pop ballad. I was sure that would be boring for them, boring for the audience, and deadly boring for me. The orchestra would have to be far more than just window dressing for a vanity project. Having said that, I was not yet ready to give up the robust backbone that my customary rhythm section provides to my songs; pop music without a strong pulse can be reduced to formless banality. For Chicago I would bring my long-standing drummer Vinnie Colaiuta, Dominic Miller on guitar, Christian McBride on double bass, and David Sancious on piano. A formidable group by any standards and, I suspected, a worthy match for the celebrated Chicago Symphony. Of course, bringing a drum kit on stage with a symphony orchestra can create as many problems as it solves. Vinnie is one of the finest drummers in the world and has massive experience playing with orchestras, but the explosive nature of the drum kit does not allow it to sit easily alongside string sections in a live context. The noise of a snare drum can literally obliterate any of the subtleties of an arrangement, as well as deafen the more sensitive ears of the orchestral players. With his usual good nature, Vinnie allowed himself to be put inside a Perspex box to ameliorate some of these problems, but it was only partially successful. No matter how subtly or quietly Vinnie played, the sound of the orchestra and the sound of the modern drum kit were a less than perfect fit. My favorite drummer ended up looking like some captured alien creature penned inside a futuristic plastic prison and surrounded incongruously by the trappings of what is essentially an invention of the 18th century, the symphony orchestra. Despite this, the concert was a great success. Both the orchestra and audience seemed to enjoy the experience. This gave me the confidence to agree to the idea of taking an orchestra on the road to entertain a larger audience, with a few strategic changes based upon what we had gleaned from this initial experience. The spirit of reinvention that surrounded the initial approach to these orchestral arrangements would also need to be incorporated into the visual aspects of the show. In collaboration with artistic director Robert Molnar, we had the task of developing an integrated experience for the audience that did not just rely on conventional arena staging. In an effort to create a unique experience, the modernist Bauhaus movement became one source of inspiration, wherein the visuals, like the new orchestrations, would serve to enhance the emotional and psychological aspects of the songs in concert. I have always had an affinity for classical music. When I was younger I studied a lot of the repertoire for the Spanish guitar and still make a daily practice of playing a number of selections from J.S. Bach, pieces from the cello suites, which fall nicely inside the range of the guitar, the violin partitas and, of course, the lute suites. Not that anyone would want to pay money to hear my efforts in this field. I do it purely for my own enjoyment; sitting at the feet of a master musician like Bach, reading and interpreting his notes on the page and watching and listening to the often astounding decisions he made as a composer, is as close as I get to religious devotion. I am not the first pop musician to borrow ideas wholesale from the Baroque master. "Whenever I Say Your Name," for example, owes a lot of its structural harmony to one of Bach's preludes. For the song "Russians," which I wrote in 1985 about the cold war, I borrowed the beautiful melody of the love themed "Lieutenant Kije" by Sergei Prokofiev. To this day I feel honored to share regular royalties for that song with the estate of the celebrated Russian composer. The orchestral arranger of "Russians," Vince Mendoza, went even further by also borrowing the opening of Prokofiev's ballet suite "Romeo and Juliet" as a stirring prelude to the song. I still had reservations about how to tackle the problem of maintaining a rhythmic pulse within an orchestral environment. Of course classical music already has a strong rhythmic pulse, but it is a different pulse from the one understood by most rock musicians or the majority of pop fans. Rock and roll is generally reliant on a strong metronomic backbeat; generally a snare on beats two and four in 4/4 time. I imagine this is a legacy from the earlier strict tempo rhythms of the dance bands of the '30s and '40s. Strict tempo in pop music equates very much to modernism, to the extent that in the current era of dance music, rhythm and tempo are almost exclusively created by machines. There are some who might consider this tyrannous or mechanical. I personally like the tension that is created when a human musician is pitted against the relentlessness of the drum machine, pulling against the tempo or pushing against it, creating subtle and infinite variations. Tempo and pulse in a symphonic setting are much more elastic, where the tempo breathes organically alongside the complexity of emotions and drama encoded within the music. Watching a conductor for a rock musician can be a baffling experience. "Where is the down beat?" we ask, "Where on Earth is ONE?" in the sweeping arc of the maestro's baton. We gaze and listen in wonder, for it can't be denied how inexplicably the conductor controls this massive, impossibly unwieldy group of separate instrumentalists and potentially warring sections, but by the subtle force of his will, his intention, by the nuance of gesture and the shared language of passion, we realize there is much to learn from this music. I shared my dilemma over the vagaries of rhythm and the orchestra with arranger Rob Mathes. He and I had met many years before with my friend, the late and greatly missed Luciano Pavarotti at a benefit concert in Italy arranged by the legendary tenor. Rob was one of those rare creatures who successfully straddles the worlds of pop and the symphony, the scion of a classical music family who also majored in rock guitar. He was the arranger for "The Wee Small Hours of the Morning" that I recorded with Chris Botti in 1999; he also arranged "Roxanne" for George Michael. We became reacquainted in preparation for the Kennedy Center Awards earlier this year when he arranged Bruce Springsteen's "The Rising," which I had been asked to perform at the ceremony in Washington, DC. I confided in Rob my fears about the orchestral realm and also of my hunch that perhaps looped electronic percussion alongside the subtleties of an experienced hand-drummer would give the songs the necessary pulse I required, a dynamic volume amenable to the orchestra, as well as an exotic and cosmopolitan color that would sound both modern and organic at the same time. I needed someone who could lay down a groove, and who had some experience in the classical world. Well that was my hunch, and my wish list, but who would be able to fill this chair? Rob would be the one to help me and said he would do the necessary research. A week or so later would find us driving through the January snow into Manhattan's Chinatown. "Is it the Orient calling us, Rob?" I asked as we pulled up in front of a downtown apartment building. "Not exactly, but did you ever see the Ang Lee film Crouching Tiger, Hidden Dragon?" "Yeah, I loved that film." "Well, the guy we're going to see was the featured percussionist in Tan Dun's music for that film." "No, he just lives here in Chinatown." We walk down some stone steps below street level and enter a dark basement studio. It is warm in the room and the clanking of ancient heating pipes seem to provide a strangely arrhythmic tattoo as a counterpoint to the noise of the traffic navigating the slush in the street outside. As we warm ourselves and our eyes become accustomed to the gloom, we appear to be in an Aladdin's cave of fascinating percussion instruments of all shapes and sizes, some familiar, some wildly exotic, and then in walks our candidate, David Cossin. I find auditions invariably awkward. It feels immensely uncomfortable to put myself in the role of judge and jury, especially on the subject of someone else's art. The best thing to do in these circumstances is to just play. Rob sits down at the piano and strikes the opening chords of "Why Should I Cry for You?" I start singing and our candidate looks around the room for something to play. He ignores the array of hand drums that festoons the walls as well as the floor and pulls out what looks like a long cardboard tube, the type used to transport large posters. A wire protrudes from one end of the tube and is connected to a small amplifier in the corner; I am intrigued, if a little concerned, that a man who plays a cardboard tube may not be quite what we are looking for. My fears soon evaporate as Mr. Cossin begins to lay down a fierce groove with his fingers on the unlikely looking instrument, one that sounds both strange and somehow utterly familiar. I realize with a knowing smile from Rob that we have found our percussionist and a large part of our jigsaw is almost complete. Rounding out the band is an accomplished group of musicians, most of whom I have had the pleasure of working with in the past and all of whom I look forward to collaborating with in this new endeavor. I could not imagine embarking on this journey without Dominic Miller, my long-time guitarist and, admittedly, my right and left hand. Dominic has been a musical collaborator and confidant for the past twenty years, and I am both eager and honored to share the stage with him yet again. My first experience working with jazz bassist Ira Coleman was upon him accepting an invitation to participate in the recording of my last album, If On A Winter's Night . . . That album also brought me to vocalist Jo Lawry, where she joined us on various promotional performances as a key support and complement to my own voice. I am delighted by this new opportunity to perform with London's premiere Royal Philharmonic Concert Orchestra, with Maestro Steven Mercurio (Bocelli, Pavarotti) at the helm helping to pull all of these musical elements together. I am looking forward to this tour with undisguised glee, having a whole new palate of musical colors to work with and reinventing the songs that have been the staples of my live performances for over thirty years. The possibilities seem limitless and my dearest hope is that this experience will inspire me to write new songs specifically with the symphony orchestra in mind. That's my ambition anyway, and I'll certainly have a lot of fun trying. 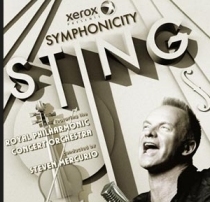 We are pleased to announce Sting, accompanied by the Royal Philharmonic Concert Orchestra will perform in Poznan, Poland on September 20. The show will go on public sale on Tuesday, July 20. The Fan Club presale will take place between Saturday, July 17 (10am local) to Monday, July 19 (3pm local).